Zaatar and Parmesan Cheese Bread Rolls – a delightful savory brunch treat – with flaxseeds, healthy fats, fiber rich and a robust flavor! These bread rolls are inspired by the flavors of the Mediterranean. 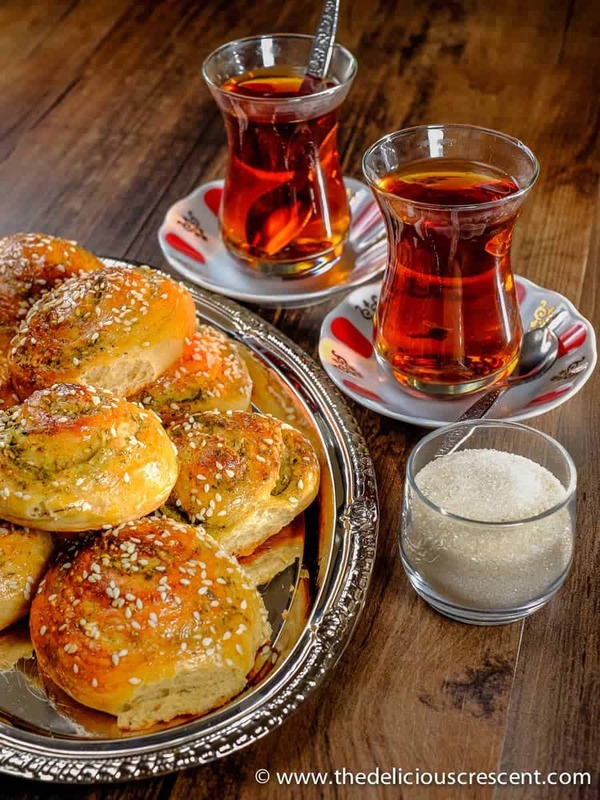 Importantly, it features Zaatar – a condiment that is a blend of herbs, sesame seeds, sumac and salt – which is ubiquitously used in the eastern Mediterranean cuisine. To give it a cheesy flavor, I have used yet another popular Mediterranean ingredient – Parmesan cheese. The nutty and salty flavor of this cheese pairs quite well with the herby flowery notes of Zaatar. The wheat bran and flaxseed meal in this recipe further enhance the nutritional value. Cheese is often feared for its fat and calories. But there are certain types of cheese that can be effectively used to give a robust cheese flavor without compromising the nutrition value. And Parmesan cheese is among the top on that list. With this cheese, a little goes a long way, as it is big on boosting flavor. Parmesan cheese is relatively low in calories and fat, when compared to other cheese varieties. It is packed with high biological value protein, highly bio available calcium as a lactate; and is a good source of vitamin A. Due to the high sodium content in Parmesan cheese, it would be important to balance the other ingredients in a recipe. This cheese is also considered a lactose free product. It does have some oligosaccharides derived from the milk and the fermentation process. And these non digestible short chain carbohydrates have been speculated to have a prebiotic function. One thing to remember while buying Parmesan cheese is that some of the brands can be loaded with fillers. So it is best to buy a block of cheese with Parmigiano – Reggiano imprinted on the rind and then grate it yourself. Alternatively it may be possible to buy grated versions that do not have any fillers. Make sure to check the labels. If you like making homemade bread here is an Indian flatbread recipe for you – Cheesy and Peppery Green Onion Paratha. 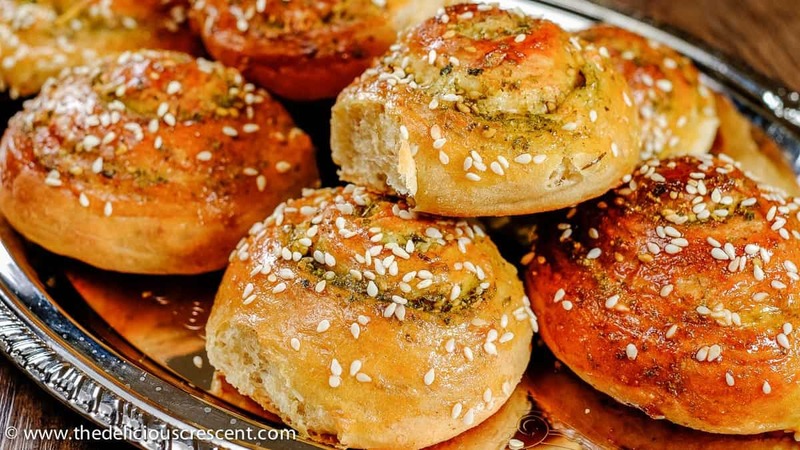 Now who wouldn’t want to wake up to some soft pillowy Zaatar and Parmesan Cheese Bread Rolls bursting with flavor on a bright weekend morning? Or for that matter any morning! Sprinkle the yeast over warm milk. Then scatter the sugar on the top. Allow it to stand in a warm dark place for 10 to 15 minutes until the yeast bubbles up on the surface. Next add 4½ tablespoons olive oil, 1½ tablespoons honey, 2 eggs, and approximately 3½ cups of the flour, salt and mix gently. Also let it stand for a few minutes to allow the flour to absorb the moisture. And add the bran and flaxseed meal and mix. Then add another half cup flour or more, as needed to make a dough that is not too sticky. Knead it rather well. It is alright if it is a little sticky. Try to use as little flour as possible to make the dough. Because it is important to make sure the dough is not very dense. I use a KitchenAid Stand Mixer to make the dough and it works great. Allow the dough to rise and double in size. The time required for this may vary between 1 to 2 hours or more. Preheat oven to 400 degrees F (200 degrees C). When the dough has doubled in size, punch it down. Divide the dough into 2 portions and let it rest. On a floured surface, roll one portion into a 12 X 8 inch rectangle. Lightly apply some olive oil. Sprinkle half the cheese and zaatar evenly over the rolled out dough. If you prefer you may scatter some red pepper flakes. Starting from the longer end of the rectangle roll up tight. Make sure to pinch and seal the edges well. Cut into 8 slices. Repeat with the other portion of dough. (Alternatively, the dough can be rolled out into a circle and cut triangles and make crescent shape rolls). Place the Zaatar and Parmesan Cheese Bread Rolls over a parchment lined baking sheet. Make sure to space them apart by at least 2 inches to allow enough room for the rolls to rise until double the size. This may take up to 30 minutes or more. Brush beaten egg on the surface of the Zaatar and Parmesan Cheese Bread Rolls. Sprinkle the sesame seeds on the top. Bake for 15 to 20 minutes until the rolls are nicely browned on the top. 1. Warm milk: 120 - 130 degrees F (50 - 54 degrees C), check yeast package instructions. 2. When you use oil in place of butter in a recipe, it is usually needed in a reduced amount than the butter that would be needed. Also I would only use light olive oil since the flavor is not so strong. For this Zaatar and Parmesan Cheese Bread Rolls recipe the oil replaces 1/2 cup butter. 3. When you use honey in place of sugar, it is usually needed in smaller quantity and adjustments are made to the amount of liquid added. (d) Placing the dough or the rolls in an oven that has not been preheated and with a pan of hot water one level below the container/baking sheet can help the dough rise better. 5. Preparation Time of 2 hours 30 minutes includes 2 hours inactive time. * The suggested amount of salt is just a guideline and may need to be adjusted. Check for any added salt in spice mixes and other ingredients and adjust. Seriously, you had me at cheese roll but adding zaatar just totally took this recipe to another level! I love it! Appreciate your insight. I really like that combination of flavors. It’s really hard to beat cheesy bread! Especially when it looks this good! I am having a love affair with za’atar right now, so this recipe couldn’t be timelier. Tossing it with parm into a bread roll is such a clever way to use it, and will also give me an excuse to introduce this flavor to some of my less, um, adventurous eaters. Ha! Thank you Danielle for your thoughtful feedback. Hope you give it a try and like it. za’atar is one of my my favourite spice blends! it’s great on naan too, these rolls look fantastic!